When it comes to brushes, there is no such thing as having "too many". To the average person, it probably looks like I am hoarding makeup brushes, but to those in the know, I barely have any! After trying loads of different brushes, I've come to the conclusion that the one area that MAC never seems to falter in are their brushes. Their brushes are very well-made, and nothing really compares. I have found that Bdellium Tools makes brushes that are similar to MAC brushes, and are super affordable. 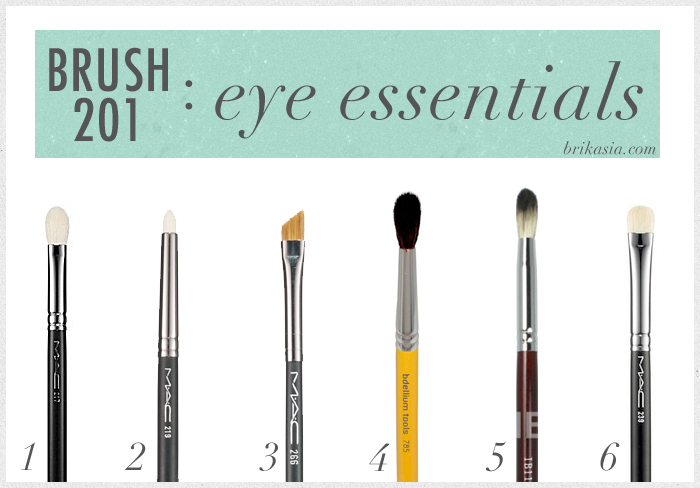 Some of these brushes made an appearance in my Brush 101 post, and are truly worth your time. What are your eye brush essentials? MAC 217 brush- perfect for any task, from applying eyeshadow to applying concealer. MAC 219 brush- perfect for precision work and cutting the crease. MAC 266 brush- perfect for eyeliner and filling in eyebrows. Bdellium Tools 785 brush- perfect for blending out eyeshadows. Crown Brush IB119 Deluxe Crease brush- perfect for deepening the crease. MAC 239 brush- perfect for packing on color to the lid, and smudging out eyeliner.